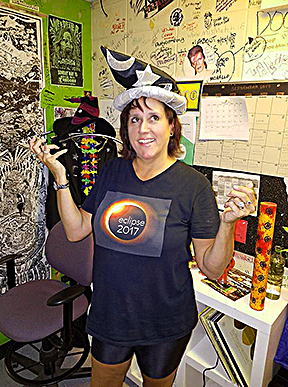 Chicago poet and Austin resident Janet Kuypers returned to Chicago for a week in August to coincide with the August 21st total eclipse of the sun (where she traveled to southern Illinois to photograph the event). During her stay she was honored with the opportunity to perform her feature show “Under My Skin” for In One Ear (at the bar next to the Heartland Café, 7000 N. Glenwood, Chicago, IL 60626) Wednesday, August 23rd 2017. Because Janet Kuypers knew she was coming back to Chicago the week of the total eclipse of the sun (and because she had no book releases of her poetry for years, ever since she moved to Austin), Janet Kuypers was thrilled that Scars Publications was able to release the first printing (from a U.S. printer) of two new books of hers, of poetry she had written while living in Austin, “(pheromemes) 2015-2017 poems” and “(pheromemes) 2015-2017 show poems” (the second book of poems she wrote for features she has had in Austin). Since her return from this trip, Scars Publications has also released the second printing of “(pheromemes) 2015-2017 poems” and “(pheromemes) 2015-2017 show poems” (from an Amazon affiliated printer, with sales from printers in the U.S., the U.K. and all of Europe). Though in the begging of her feature she read her poem about the total solar eclipse that she wrote 12 hours after witnessing and photographing it, everything she otherwise read in her show was from these two books, and she also sold proof copies to audience members after the show. Janet Kuypers' "Under My Skin" poetry show 8/23/17 @ Chicago's "In One Ear" (Lumix Hard Light). Janet Kuypers' "Under My Skin" poetry show 8/23/17 @ Chicago's "In One Ear" (Sony). Janet Kuypers was also photographed during the live Chicago show, so people can still view the album of 20 photos live 8/23/17. Before the show started, Janet Kuypers also handed out select print copies of the Scars Publications chapbook “Under My Skin”. The chapbook is also available online anytime for viewing or download.